Fuyuki City will be changed forever following the events that will come to be known as the Fifth Holy Grail War. 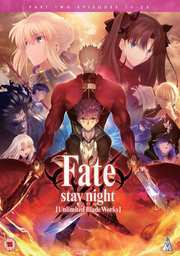 With the Masters and Servants slowly revealing themselves and their intentions, the stage is set for the grand finale, and at the center of it all is Shirou Emiya and Rin Tohsaka. The Holy Grail War continues, with each Master and Servant duo making their move for the omnipotent wish granter. Caster’s plans have been set in motion, beginning with taking Saber captive while Rin and Archer go their separate ways to continue their fights on their own. Without Saber’s aid, Shirou’s principles are put to the ultimate test. With many battles to come with expected and unexpected enemies, Shirou’s resolve begins to take form. Is his desire to protect people and become a hero, genuine? Or are they simply borrowed feelings? And will it be enough to carry him to the end?